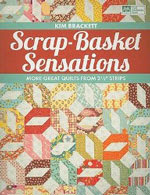 Welcome to Day 3 of the Scrap-Basket Bounty Blog Celebration! Thanks to all who visited earlier. In case you missed Day 1 and Day 2, click the hyperlinks to visit those posts. 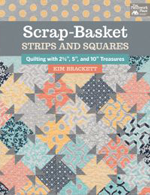 In case you haven't visited yet, to celebrate the release of Scrap-Basket Bounty, published by Martingale, I'll be sharing two or three quilts each day, and giving away copies of my new book and a few other things that I enjoy using when I design, sew, and quilt. 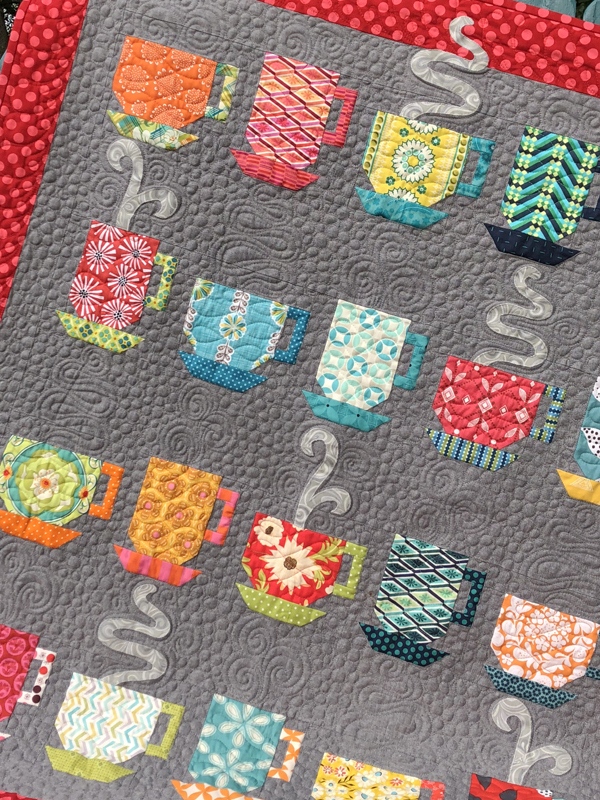 Scrap-Basket Bounty has patterns for 16 single-block quilts with additional layout options -- a total of 48 different quilt designs! I started quilting in 1988, but didn't actually finish my first quilt until 1998, ten years later. (I just made hand-pieced blocks for 10 years, at a very slow pace. They're still around somewhere, and still not sewn together.) My first finished quilt was a pieced and appliqued quilt that I hand-quilted. After hand-quilting several quilts, I dove head-first into machine quilting, thinking I wouldn't live long enough to hand-quilt all the things I wanted to make. Machine quilting was very awkward -- my feed dogs didn't drop, my machine didn't have an extension table, and it wasn't fun at all. But I was determined to learn. Sometime around 2003, I bought a machine with a small extension table and I was able to lower the feed dogs on the machine. It was a game-changer. Since then, I've quilted only by machine. When I finish a quilt top, I look forward to getting it basted and under the needle. It's such a relaxing process for me now. 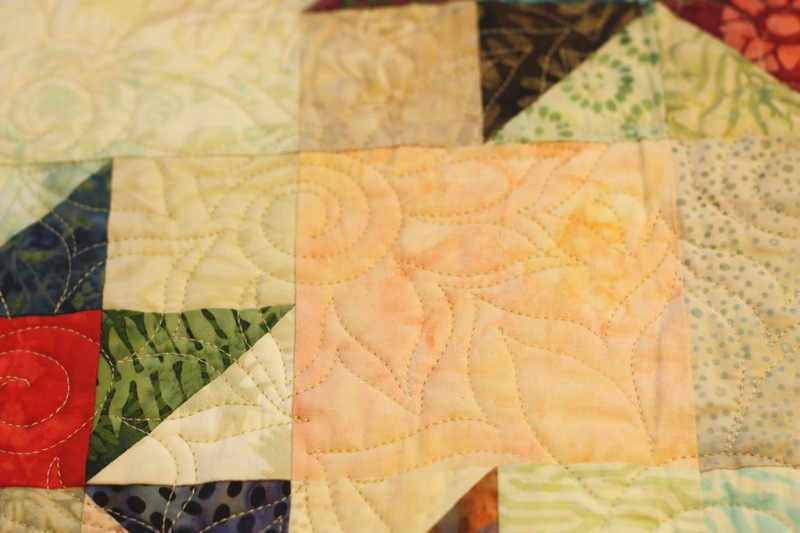 If you've tried machine quilting unsuccessfully, don't give up! Practice, practice, practice until you feel comfortable with it. I decided to try quilting with rulers and chose Log Cabin-ish (above) for my first attempt. The center of the quilt is an all-over swirl design, but I used a ruler to quilt the echoed straight lines in the border triangles. The block in Falling Stars is a great one for re-arranging into different layouts. (I'll be showing you more about that later this week.) 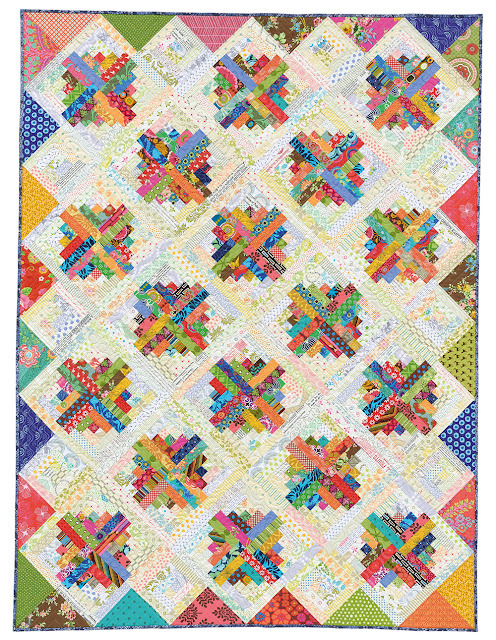 Falling Stars is quilted with an all-over swirl and petal design. Here's a close-up photo to show you a little more detail. 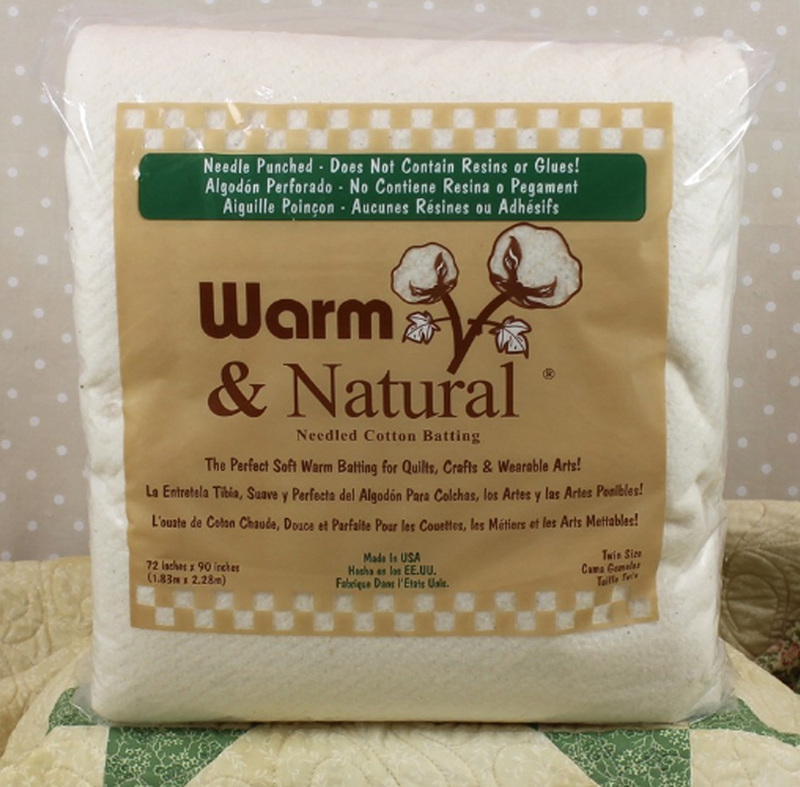 Since the first quilt I machine quilted, I've almost exclusively used Warm & Natural, a needle-punched 100 percent cotton batting, manufactured by The Warm Company. It has a consistent thickness -- no lumps and valleys. It stays in place when layered between the top and backing, so it doesn't require as much basting, and my quilts lie flat and even. It also washes beautifully. 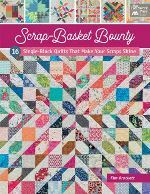 Martingale has generously offered to send a .pdf copy of Scrap-Basket Bounty to the winner of a random drawing. I will also send the winner a twin-size package of Warm & Natural batting. 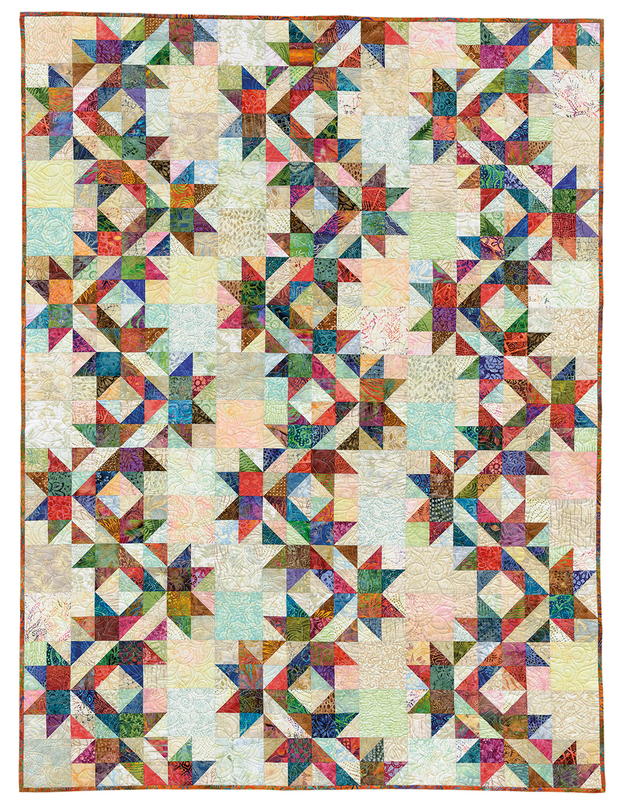 If you'd like to win a copy of Scrap-Basket Bounty as well as a package of this luscious batting, just leave a comment here and let me know where you stand on machine quilting (tried it, love it, hate it, or no thanks, etc.). The giveaway will close on Sunday, September 30, at 10:00 p.m. CDT. The winner will be announced at the end of next week. Thanks so much for visiting! Hope to see you here tomorrow! Update: Comments are now closed for this post. Thank you for visiting. Wonderful quilts, and I love the name 'Log Cabin-ish". Machine quilting- I appreciate it's contribution to getting quilts completed quickly, and I'm good with it up to a certain size quilt. I'm able to free-motion quilt them, but at a certain size, I'll have a long-armer complete the quilt. My love is hand quilting, but cannot keep up with the number of tops I make. Plus my hands don't work like they used to- my skills have peaked as a hand quilter. Congratulations on the book. Scrap quilts are always a favorite. And thanks for the opportunity to win. I love machine quilting!! Especially with my new machine, recommended by a friend! I tried hand quilting and I love the look. It just takes way too long for me. Log Cabinish is beautiful! Thanks so much for sharing your beautiful quilts. I'm in love with your Falling Stars quilt. I have tried machine quilting on my Juki sewing machine, but as to doing a whole quilt, I haven't accomplished that yet. I would love to get better at doing designs, but so far have just mastered the stipple. Thanks for the encouragement!! Hello. I’m loving the quilts in your new book. I have so much fabric, it’s almost ridiculous But I’m always in the market for more and love books as well. I try to machine quilt most of my projects at least up to full size. I hand quilt too but I get bored to my easily. I started quilting with my domestic Husqvarna machine - and still have it - but really struggled to quilt twin size quilts. Too much fabric to wrestle in the available throat space! I now have an HQ Amara and love it. Love seeing your pattern layouts. I am a huge fan of log cabins and their versatility in layouts so your designs are so intriguing. Can't beat a good HST. Hoping to win. I have tried machine quilting on my home sewing machine but find it works best on small projects. I also started hand quilting and then moved to machine quilting. Next up was a longarm that I love playing with. It is the only way I will ever get all the quilts finished that I want to make from your latest book. I can’t wait to see this book! Your quilts are so exciting. I adore machine quilting, although I totally admire hand quilting as well. There’s room for both in my world! I enjoy machine quilting smaller projects, but I am somewhat limited as to what I can do. I have done grids, and rows of straight or wavy stitches, but I am not very good at free motion quilting. Anything larger than throw-size goes to the longarmer. I used to machine quilt only minis and table runners, and send all my other sizes to a longarm quilter. Now I have a longarm and use it for everything, even placemats. Congratulations on the new book!! Beautiful quilts. And quilting! I do my own machine quilting on my sewing machine. I'm not very artistic, but even using geometric shapes, I love the process. Thanks for sharing your thoughts and experience. 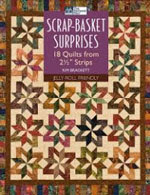 I love your quilt patterns and have several of your books. I have started to FMQ and just completed my first quilt using rulers. At first I was very intimidated by the "quilting" part however now I quite enjoy it and find I have such a sense of accomplishment when it is all done. Your new book looks amazing and I would love to win a copy. Love the Falling Stars quilt! I have a love/hate relationship with machine quilting. I love machine quilting on my long arm quilting machine, and hate machine quilting on a regular sewing machine. I just tried FMQ on my DSM. I was rocketing along and then bam, something changed and it would not pick up the bobbin thread. After a brief lull, I will try again! I love the Falling Stars quilt. I have machine quilted from the beginning, starting in 1957. I actually didn't know anything about hand quilting at that time being self taught but I knew how to use a sewing machine. I machine quilt all my donation quilts and quilts made for children, and up to queen size. I still love to hand quilt and that is much more relaxing for me than machine quilting. I learned FMQ on an old Singer 15-91 but now have a Janome 7700 for quilting. I own a very old, second-hand HQ16 and for years was too intimidated to even use it. I'm getting braver now and trying different quilting designs. I'll never be a super star feather quilter, but love to be able to make my quilts from start to finish. Machine quilting all the way! I would love to someday own a longarm, but for now I do all my own quilting on my Bernina. I even machine bind most of the time. Thanks for the chance to win! I'm really enjoying your Scrap Basket Bounty parade! Oh, that Falling Stars quilt ... I absolutely love it! I’ve machine quilted all my quilts and tried a little big-stitch hand-quilting on the one for my baby granddaughter last year. Straight line machine quilting always works and I’ve attempted FMQ but it’s definitely a work in progress. Your book is wonderful. Thanks for the chance to win. Machine Quilting -- love it! MQ with rulers, even better! I was fortunate that machine quilting had become acceptable by the time I started quilting so I set out to be a machine quilter from the beginning. Then I felt the pull to learn to hand quilt after I was about eight years in and did my first hand-piecing project only three years ago! Machine quilting does allow you to get your projects done faster and the beauty of some of the stitch work being done today on machines rivals that of the best hand quilted works. There are some projects though, that call out for some focused hand work too! It's great to have a choice of how to complete a project. I do enjoy machine quilting and would love to try those little rulers. I’m loving everything I see from your new book! Awesome job! I machine quilt all of my quilts with my Bernina. At first it was simply tolerable but now I enjoy quilting small quilts. I don't mind quilting bed-sized quilts but i don't love it. It is a means to an end and I really don't want to pay someone else to do it. I'd rather buy fabric and books. I have done some free motion quilting on my dsm but I am not very comfortable with it. I Don't do it frequently enough to stay in practice. 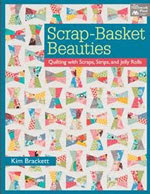 I love scrap quilts so am delighted with your new book! I love machine quilting. I purchased a longarm a couple years ago, because sending quilts out to be quilted became more expensive each time and the wait time was at least six months, so I'm actually saving money quilting them myself. (That's what I tell myself.) More money for fabric, books, and rulers. I’ve tried machine quilting with limited success. I’m not very confident and don’t want to ruin a project that I’ve worked hard to piece. I need to dedicate more time to practice. The only machine quilting I've done is straight lines on mini quilts. Perhaps one day I'll get the courage to try free motion. I tried machine quilting about 15 years ago but never became proficient at it. I was lucky enough to get a longarm machine 10 years ago and I LOVE it! Beautiful book...congrats! I have been FMQ for some years by now and am completely addicted to it. Constantly am in conflict as to whether to FMQ or do some piecing. The FMQ wins out every time. Last year then I got the Sweet 16 and am currently learning to use rulers which is shaping up to become the next addiction. Your book looks great! I like to machine quilt but hated to baste, so I got a longarm. I'm still learning, but it's fun! Thanks for the giveaway chance. I’ve been machinevquiltinf a long time on my domestic machine, but I don’t get results as nice as yours, probably because I don’t plan much, I just sit down and try to get the whole thing quilted as fast as possible. I really like your scrap quilts and I’d like to try them. And I know you live nearby - if you give machine quilting demos I’d love to watch. Thank you for the wonderful giveaway. I have tried machine quilting. I like it for smaller projects but I have not done a full size quilt yet. I have hand quilted a king sized bed quilt and it took about a year to complete. I really did enjoy doing it though. I use my machine to quilt also, and I enjoy that method as well. Thanks! I've tried machine quilting and only do straight line quilting on my DSM. I do rent time on a long arm to finish some quilts. A select few get sent to someone else to long arm. I am finally getting comfortable enough with free motion quilting that I actually find it fun and enjoyable :-). I started quilting in 2001 and this new revelation just came about in the past couple of years. As you said, practice, practice, practice is the key! I love machine quilting on my longarm. I find quilting on a domestic machine to be much more difficult. I find quilting on my domestic machine to be slow and awkward, so I lose patience with it quickly. I've taken lessons and rented longarms a couple times and wish I had the space and money for my own! I've quilted small items on my DSM but have yet to do a large quilt. I dread it because I have to work in such a small cramped space. I like doing it on baby quilts and smaller projects. Anything bigger goes to the longarmer! I love machine quilting. Definitely made better by having a machine with a big throat space and recessed into a table with a big surface to hold the quilts. Your designs are so exciting! I'd love to win a copy of your new book to add to my collection of your earlier ones. I only do FMQ on smaller projects. I don't have a good place to layer quilts and can't wrestle larger ones thru the throatspace on my Singer 501-A. 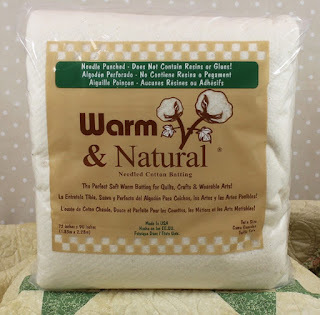 I love using Warm and Natural to quilt with! Your story of the transition to machine piecing makes me remember the look I got from my neighbor, who was a famous quilter when I first talked about machine quilting in the early 1990’s. It’s interesting to look back and see how quilting has changed even during the short time I’ve quilted. I love machine quilting. I’m proficient at straight-line but would like to improve my free-motion skills. I just need to make time for practice!!! I'd love to improve my machine quilting and have a mid-arm for that purpose, but spend way too much time piecing to practice! I love machine quilting smaller quilts. I only do quilting with my walking foot and Bernina, but i’m happy with the results. Nope, next to no machine quilting for me! The most I will ever do is stitch in the ditch on smaller projects like a wall hanging or pot holder!! Thanks for this chance! I am strictly a machine quilter. My aging hands couldn't handle hand work! I'm learning rulers and getting more comfortable with FMQ. I deliberately bought a regular machine with an 11" harp area and I love it! I machine quilt because I feel like it’s not mine if someone else quilts it. I love to piece! I have big stitched a large quilt and loved everything about the process and the look. I don’t like really dense quilting and motifs. I like straight line, Baptist fans and traditional quilting. I love Lob Cabinish - great colors and great design! I enjoy machine quilting a lot - so much that I bought my own longarm. I also enjoy quilting on my sit down for small quilts. It does take lots and lots of practice! a copy of your book. It looks like a fun book. I love to machine quilt. I'm not as good at it as I'd like to be, but I just keep quilting hoping for the day when my swirls are round and my leaves are pointy. I do quilt smaller quilts, table runners and toppers on my Juki. I think I would really like it if I could learn to slow down and enjoy the process! I have signed up for a class at my local Bernina dealer to learn to use rulers and I looking forward to that. I'm not crazy about machine quilting, but can manage to do it on smaller pieces like baby quilts. I like both hand quilting and machine quilting but an better at hand quilting! I started out feeling like I just had to machine quilt my own quilts for them to be "mine". As I've started doing much bigger quilts and experience fatigue in my hands and shoulders more these days, I've taken to doing the quilting "by checkbook". And isn't putting all the beautiful fabrics together the most fun part, anyway? I enjoy machine quilting on lap quilts or smaller and even have a pretty even stipple both tiny and big. I have used some Golden Threads paper as well as Pounce with stencils. But I just don't have the strength to muscle bigger ones around. And so then I use my checkbook to quilt them. I enjoy everything about the process of making a quilt, even basting! Jo-Ann's Creations, Trials & Tribulations!